Winning the award for Destructoid Game of the Year is probably more important than winning the Nobel Prize. And I am not being overdramatic at all. Think about it. Who won the Nobel Prize for Chemistry last year? Can’t think of the name, can you? But when someone asks who won the Destructoid Game of the Year in 2010, the answer is simple: Super Mario Galaxy 2. You see? Winning the big prize on Destructoid is a much quicker route to instant Internet fame than the Nobel Prize will ever be. It’s a completely reasonable argument. So which game will join the ranks of past winners BioShock, Left 4 Dead, Uncharted 2: Among Thieves, and Super Mario Galaxy 2, and win the highly coveted award for Destructoid Game of the Year 2011? Out of all the incredible videogame adventures this year -- and, my word, there have been a lot of awesome ones -- Portal 2 is our favorite. From the perfect (yup, perfect) single-player campaign, to the addictive, challenging co-op mode, Portal 2 is an absolutely extraordinary videogame experience. Obviously, going into too much detail about why we adore the game would ruin things for people who haven't played it yet, so ... wait, if you are reading this and haven't played Portal 2, stop everything you are doing and play it already! Seriously. It is one of the best videogames of all time and JUST WON OUR GAME OF THE YEAR AWARD! Go. Play it. Now! Okay, now that those people are gone, let's get into what makes Portal 2 so amazing. Portal 2 does everything right. There really isn't one aspect of the game that is not done well. In fact, there is not one aspect of the game that any other videogame did better this entire year. The overall design is unrivaled, containing puzzle-centric levels that should be listed in every "How to Perfectly Design a Videogame" book. (If those actually exist.) 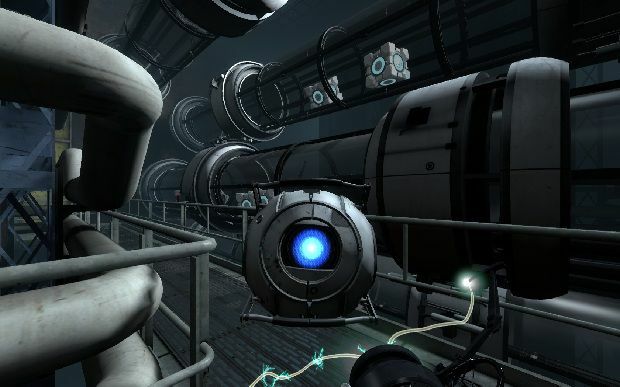 While the first Portal revolved entirely around the use of the magnificent portal gun, Portal 2 feels like a massive, deep, surprising adventure that just so happens to feature the already classic portal gun. And that says something about the bravery and confidence of the people at Valve. Portal 2 is the perfect sequel that doesn't just ramp up the gameplay with new modes and levels (although those are there as well). Instead, Portal 2 takes players on a journey full of breathtaking, memorable moments, shocking plot twists, mysterious and unexpected locales, and one of the greatest scripts and voice casts to ever grace a videogame. Think back to how unbelievably perfect the pacing is in the game. 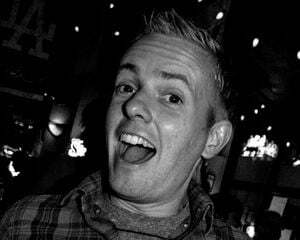 Think about some of the wonderfully memorable moments: the opening, with a moving apartment; the descent into the retro bowels of Aperture Science; the potato; Cave effin' Johnson; the ending! AHHHHH! THE ENDING! No other ending in a game this year was as memorable, outrageous, or just plain fantastic. 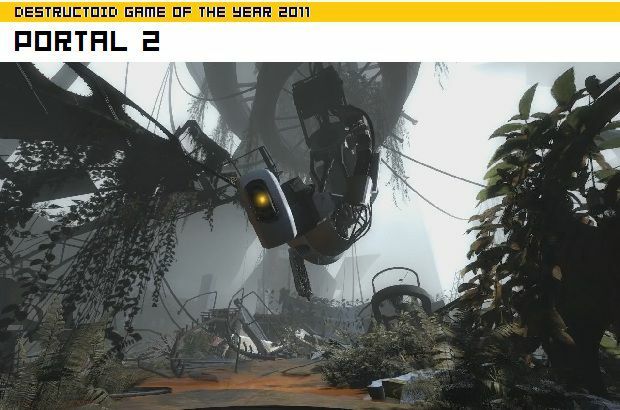 Portal 2 is an extraordinary game and a more-than-worthy winner of Destructoid Game of the Year 2011. 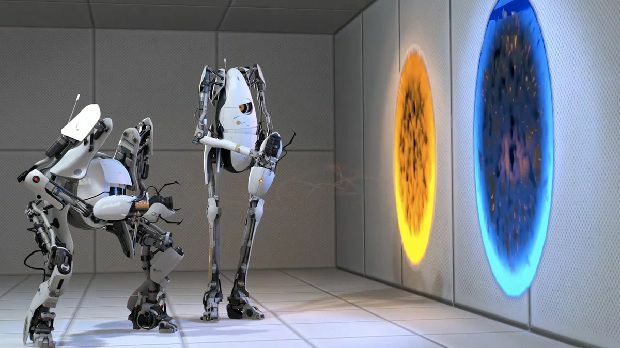 Congratulations, Portal 2 ... and congratulations, Valve! You made one heck of a good game. What do you think? Did the right game win? (Answer: OF COURSE!) 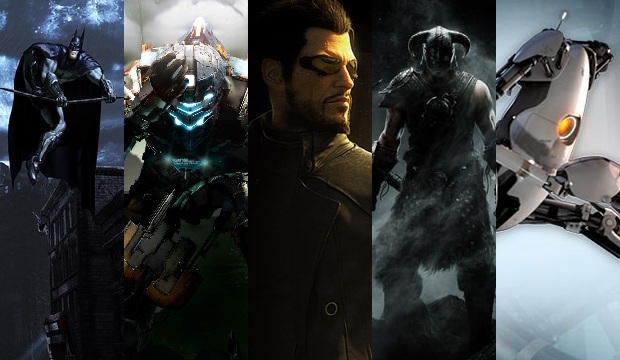 What is your favorite videogame of 2011? Oh, and if you haven’t watched the header video, definitely check it out. It stars Tara and Max of the Destructoid Show. Both of them are ridiculously attractive, so just the sight of them is sure to make your upcoming holiday that much merrier. Here’s to a fantastic 2011 and an even better 2012!